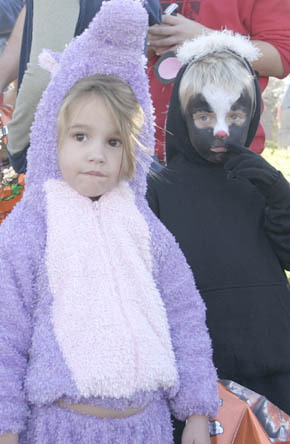 An extra large crowd of youngsters donned their costumes to participate in Halloween events last Friday, Oct. 31, in downtown Albion. At courthouse square, the Chamber of Commerce announced winners of the Pumpkin Decorating Contest, and picked winners in four categories of the Halloween Costume Contest. An estimated 300 children then went trick-or-treating at downtown businesses.